May 3, 2013, 10 a.m. – May 3, 2013, 5 p.m. I'm gonna finish up BioShock and then play an indie platformer game recommended by my roommate: Thomas Was Alone! People have been raving about BioShock: Infinite, so I'm gonna PLAY THIS BAD BOY! Probably on whatever the highest difficulty is. 1999 mode is a thing I hear? This is my FIRST PLAYTHROUGH of portal. I'm seriously dedicating to catching up on my essential gaming literacy. If you enjoy watching me squirm and struggle and enjoy the act of facepalming, tune in to my playthrough of Dark SOULS! I'll be building a city for YOU, wonderful folks of the chat. Before I play on Friday, I need to know the city name that you want. Post below! Day's Day Off - SC2 2v2v2v2 & Monobattles! Time to play tons of subscribers 2v2v2v2s and monobattles! Let's play StarCraft ALL DAY and have a blast <3. 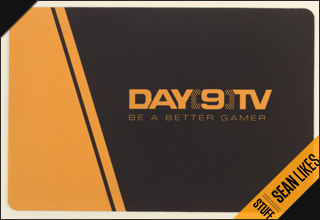 To subscribe, head to https://secure.twitch.tv/products/day9tv/ticket/new and get bonuses!